seawapa.co: Scotland’s Independence from the United Kingdom: What Happens to England? As if Prime Minister David Cameron hasn’t got enough problems, the promised referendum allowing Scotland to vote on whether people want independence from the rest of the United Kingdom looms ever closer, and some polls show that the gap between the Yes and No camps is closing. One reason for the increasing number of once-independent areas seeking to regain that independence is that people also want to recover their character, their heritage, their sense of belonging to that particular patch of the earth which defines who they are. Let me make it clear – I am English. I am British in the sense of belonging (as did my ancestors) to the British Isles, which is not a nation but a geographic location, a part of which is England. I come from a place, not a political entity. And I am definitely not United Kingdom-ish. I have huge loyalty to my land but little in the way of political “patriotism”. When I visit Wales or Scotland I am conscious of entering countries separate from mine, full of Welsh and Scots – not Brits. We define ourselves as Welsh, Scottish or English. We belong to countries with different accents, idioms and languages, different histories and cultures, legends and customs, and ways of thinking and perception. And I love it that way. Therefore I respect the fact that many Scots want to return to being independent of the United Kingdom – not that any of our ancestors got to vote on the issue of being “United” back in the 17thcentury. I also respect the fact that the Scots are holding a referendum on whether to regain their independence from Westminster, and that it is their referendum, not mine. But as an Englishwoman, I am ashamed of some of the arguments put forward by the “Better Together” camp. That title for a start. And the launch of Better Together was used by ex-Chancellor Alistair Darling, himself a Scotsman, to make much of the fact that an independent Scotland would “lose its standing in the world”. Even worse, a diminished United Kingdom would lose its “clout”. Very important, clout is, to self-important politicians. They don’t get to interfere in other countries’ affairs, something that other countries might consider a good thing. 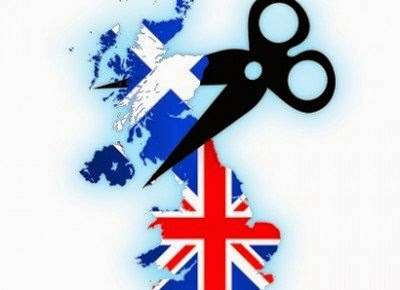 How tediously long is the list of what Scotland would lose if it cut its ties with England. Oh yes. It isEngland that is all-important. Little mention is made of Wales or Northern Ireland, but then they are not host to Westminster or the “financial capital of the world”. Better Together said Scotland can’t be part of the EU. Why not? They can easily apply for membership or is Westminster going to have a hissy-fit and veto their entry? But the ex-head of the EU Commission Jose Manuel Barroso said “it would be extremely difficult”. Ex-Prime Minister Gordon Brown threatens an independent Scotland with the loss of the EU rebatethat we currently enjoy. Where EU membership is concerned, would Scots be worse or better off? How much do they really benefit from the UK’s rebate – compared to England? Better Together says they would be worse off. The Yes campaign says not, and points out that Gordon Brown, Scottish born and bred, didn’t negotiate a better deal for Scotland when he had the opportunity. Up pops the Labour Party leader Ed Miliband saying that “Scotland may need border controls”. Surely not if Scotland stays within the EU, where there is free movement across borders. What next – a re-fortification of Hadrian’s Wall? Scotland couldn’t possibly share our currency, although for many years Scottish banks have issued Scottish currency. And the Committee of Scottish Bankers has this to say: “… no banknote whatsoever (including Bank of England notes!) qualifies for the term ‘legal tender’ north of the border and the Scottish economy seems to manage without that legal protection.” So they could print their own, no problem. Or, perish the thought, they could adopt the Euro. There might be a problem with the banks themselves – the main Scottish banks are not Scottish owned. How many UK financial institutions, utilities, insurance/pension funds and corporate businesses are solely UK-owned? Ah, but so many businesses operating in Scotland would have torelocate. Why? Business locates at its convenience; where money is to be made or where there is a good labour force. Big business these days doesn’t do nationalism or patriotism (if it ever did), despite what the CBI tried to maintain. Some of these arguments are looking a little desperate, and the more ridiculous ones result in a few more people saying they’ll vote for independence – which must be why the big guns have been rolled out. It started in January with Vladimir Putin on the Andrew Marr Show, although Education Secretary Michael Gove has just opined that Putin would use Scottish independence as an excuse to “dictate to the world”. Seriously. But if people like Barack Obama, Hillary Clinton, Pope Francisand Chinese Premier Li can now stick their oars into the referendum debate, then so can I. I am, after all, a rather nearer neighbour to the Scots than any of them. This frothing and foaming at the mouth from Better Together always seems to boil down to one thing – money. Sir William Patey claims that only by remaining a part of the UK will Scotland have access to the IMF and the World Bank. Why would they want to since, should Scotland run into financial muddy waters, the IMF and the World Bank would be the first to come knocking at their door offering, as they have with other poor benighted countries, the kind of financial assistance that will pauper them for the foreseeable future. Why not consider what we would lose if Scotland became independent, apart from what’s left of North Sea oil? And Faslane. With nowhere else to base them, the Trident missiles would have to go. James Watt, inventor and mechanical engineer, renowned for his improvements in steam engine technology. The unit of measurement of electrical power – the watt – is named in his honour. Another engineer, John Logie Baird, invented television, without which the world would be a very different place. Unfortunately the lords being lords and fond of owning as much as they could, they ended up with the land and the Kirk got the kirks. But there, for some, is another reason for Scottish independence – the possibility that they will finally follow up on their Land Reform Act. Looking at that small snapshot of Scotland’s richness of invention, capability and expertise, I think it sheer arrogance for Better Together to insist Scotland can’t exist without the rest of us. The arguments for a No vote would be more impressive if they talked about how, in so many ways, the rest of us might be impoverished if Scotland chooses to leave us. And whether Scotland becomes independent or remains within the UK, it will always be its unique Scottish self. The Scots will see to that.